Spotify has been a leader in the busy music streaming services arena. With the arrival of Apple Music and its reach and influence, Spotify faces a strong competitor. Here we'll look at each service's pricing, music selection, user experience, and other features to help you decide which streaming music service is best for you. Spotify offers a free tier, but it plays ads every few songs. Apple Music is ad-free, but its free period is only 90 days. Spotify's premium account is free for the first 30 days. To use Spotify or Apple Music on an iPhone or another mobile device, you pay $9.99 per month for unlimited, ad-free streaming and offline listening. A big differentiating factor for listers is the availability and selection of songs to stream. The size of a service's music library is crucial when comparing services. Both services provide similar catalogs and offer content exclusive to its subscribers. Apple reports its catalog holds over 40 million songs, while Spotify claims "30 million plus" songs while touting the addition of another 20,000 songs to its library daily. All the major artists are represented on both music services — including Taylor Swift, who feuded with Spotify for years but is back on the music service. Winner: Close, but Apple Music appears to have a slight advantage. Along with price and music selection, you should consider the ease of use and overall experience of a service when making your choice. Spotify has the better user experience — for now. Ease of Use: Spotify is easier to use than Apple Music. You can open Spotify and start listening to music quickly without much experience. Apple Music is a bit of a tangle of menus and inconsistent behavior across devices. Changes to how music syncing works between a device and iTunes when using Apple Music and iCloud results in some considerable frustration for those who are used to managing the music on their devices. Spotify's free tier, however, can present some annoyances because of the interruption of ads. Music Discovery: A music service should help you discover new music you'll love. On this front, the competition is a tie. Spotify is fairly good at presenting related artists, but some recommendations are dead ends. Apple, on the other hand, hasn't integrated discovery as well, so finding new music on your own on a mobile device isn't as easy as it should be. However, its expert-driven recommendations are promising and given time and development should mature with the service. There are other areas where each service shines — or dims — when compared. Offline playback: Both services offer the ability to download music with their paid plans. Collaborative playlists: Spotify lets you work together with other people to create playlists, while playlists are strictly solo in Apple Music. Integration with existing music file libraries: Apple shines here. Downloaded Apple Music songs are saved into iTunes or the Music app to make them indistinguishable from other tracks. With Spotify, they're separate and can't easily be combined. Radio: Both offer it, but between Beats 1, Apple's curated stations, and the reinvented iTunes Radio, Apple stands out. Audio Quality: Spotify streams at up to 320 kbps, while Apple Music is 256 kbps; however, the difference here is unlikely to be noticeable, except perhaps in the slightly larger consumption of data plan allowance for 320 kbps music if streamed over your cellular network. Streaming: Both services stream music, music videos, exclusive offerings, and other audio content. Apple has a huge music catalog and integrates seamlessly with other music libraries, but it's not as easy to use. Spotify is simple to use, has an enormous subscriber community, and delivers a better user experience; however, it has a slightly smaller music library, and it doesn't easily integrate with other music libraries. If you're an Apple user with lots of music in your library, Apple Music offers a great experience. If you already use Spotify and are happy, Apple Music isn't good enough to contemplate a switch. 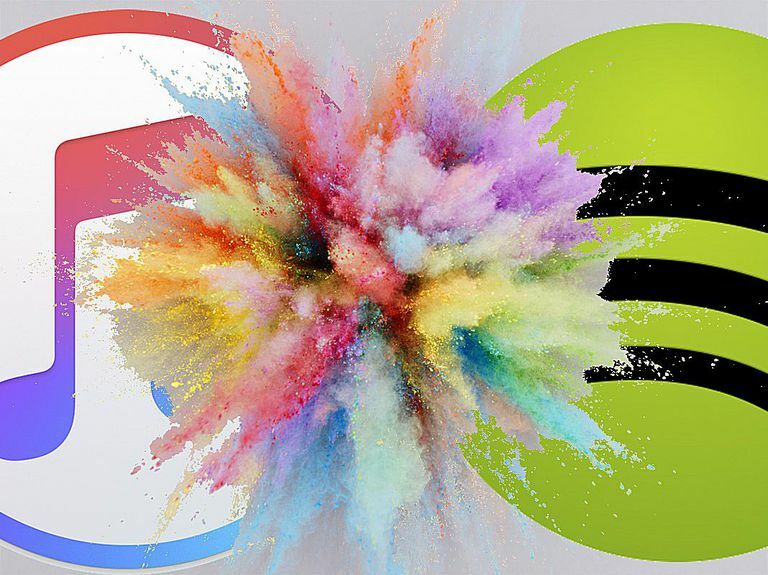 Even though Spotify might have a slight edge now, these two premium music services are neck-and-neck in quality and value. The choice may come down to personal preference.